It’s time to say farewell to summer and hello to brisk fall weather. Paul Frank would like to help you and your readers welcome the chillier season with a sensational Fall Snuggle package. 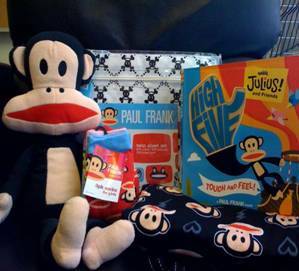 The package includes Paul Frank slippers and pajama pants for mom, fabulous Skurvy bedsheets, High Five (a touch and feel book), and a plush for the kids. One (1) lucky LAB reader will receive a Fall Snuggle pack of their own! There are many ways to enter. Each counts as an entry! 1. Click here to leave your email address on my contest entry form. 3. Become a fan of LAB’s Facebook Page. Then leave a comment on the wall saying why you love the Paul Frank Fall Snuggle pack.